AMB driving tuition offers quality and affordable driver tuition in Exeter (and surrounding areas) for your route to early driving test success. We pride ourselves in offering the highest level of tuition coupled with help, guidance and support tailored to your needs from your very first driving lesson all the way through to the big day of your driving test. We offer help and advice and can point you towards some great resources to enable you to make a great start with success in your theory test and can also get some great discounts on revision materials. We will prepare you for both the theory and practical test with a personalised learning plan tailored exactly to meet your learning style encompassing a structured sylabus with ‘goal’ setting so we can continually monitor and evaluate your progress. Once we are ready for the practical driving test we will work together and prepare you fully for your test, getting you ready with guidance and advice on helping you to control your emotions so you now what to expect on the day. Once we have successfully got you through your test we can look at any further skills you may need to develop be a competent, confident and safe independent driver. Find out more about the Driving test, from obtaining your provisional license, help and guidance with your theory test, through to information about what will be expected of you as a driver in your practical test including show me, tell me and independent driving. We currently have some great offers and discounts for new student drivers and existing driving students in Exeter, Mid Devon and the surrounding areas. 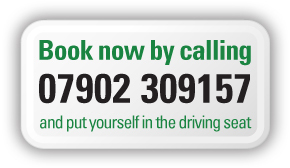 Call us today on 07902 309157 and put yourself on the road to independence.